“DNV GL has been at the forefront of assessing Lidar technology and other Remote Sensors. The objective of this framework agreement with ZephIR is to further advance the standardized adoption of wind remote sensing technology in the wind industry.” – Detlef Stein, Global Head of Practice Resource Measurements at DNV GL. 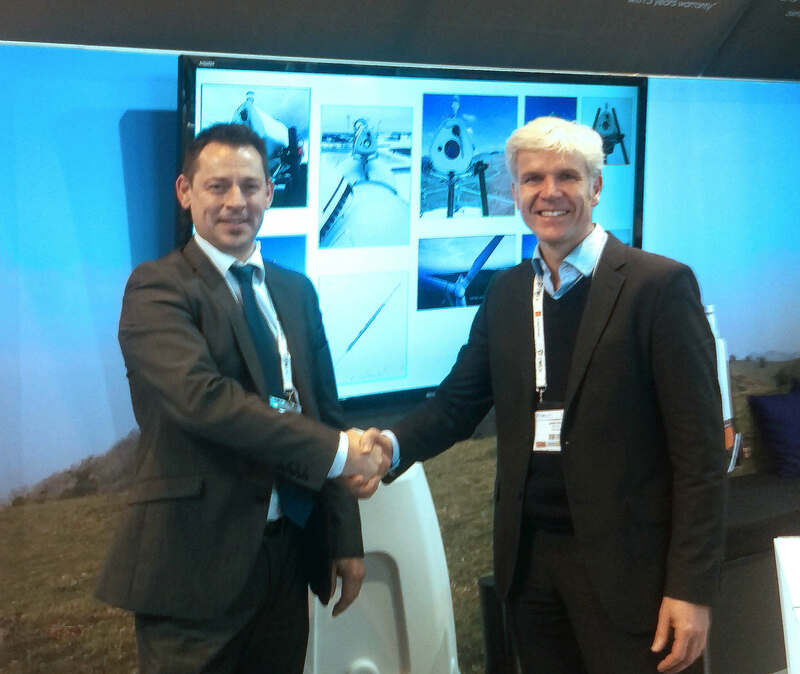 Ian Locker, ZephIR (left) signing framework with Detlef Stein, DNV GL (right) at EWEA 2015, Paris this week. DNV GL, the world’s largest resource of independent energy experts and certification body, is widely acknowledged as a leading technical authority on wind energy for nearly three decades. The company has applied this authority to the emerging field of remote sensing, specifically its use in the context of the development and financing of wind farm projects. A signed framework agreement between DNV GL and ZephIR Lidar demonstrates the continued and repeatable ability for the ZephIR 300 wind lidar to conform to IEC 61400-12-1 (revision Ed.2, CD, Annex L) , which describes the application of Remote Sensing for Power Performance Measurements of Wind Turbines. DNV GL considers ZephIR 300 to be at Stage 3 under “benign” conditions – accepted for use in bankable / finance-grade wind speed and energy assessments with either no or limited on-site met mast comparisons. ZephIR was the first commercial wind lidar system to achieve accreditation at this level. The framework allows customers to request a ‘DNV GL Independent Quality Report’ in addition to the standard Performance Verification provided with all new systems. ZephIR 300 measures wind characteristics onshore and on fixed or floating platforms offshore from just 10 metres (33 feet) up to 200 metres (656 feet) above the installed position to inform wind regime and quality studies during the development and operation of wind farms onshore and offshore. ZephIR 300 is accurate, reliable and affordable, adding value to wind energy projects at every stage – from pre-planning, through development and on to operation. Every system is uniquely subjected to an industry-approved validation process, part of which occurs at the UK’s Lidar and Sodar test site, ensuring repeatable finance-grade data. © 2015Zephir Ltd. All rights reserved. ZephIR, Zephir, ZephIR 300, ZephIR DM, ZephIR Care, ZephIR Power and Waltz are trademarks of ZephIR Lidar. Other company and product names may be trademarks of their respective owners.